Fall is the time when days are shorter and fall-colored foliage and decorations abound. It’s also a time of dormancy and death when annual plants die and decompose into great soil, while other plants enter a long sleep, storing energy for next spring. Let’s discuss black-as-night crows, their lives and their flocking as signal of the end of summer time. They often symbolize and remind us of the dormant season ahead. Crows are members of the Corvid family (crows, ravens, jays and magpies). American crows (Corvus brachyrhynchos) are also called the common crows and are one of the most frequently seen and heard birds. 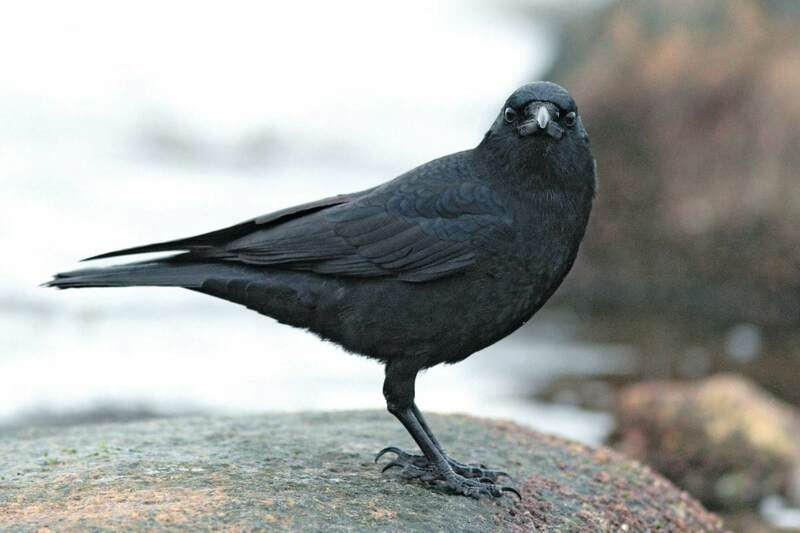 However, the crows in the West Sound area are a separate species called Northwestern crows (Corvus caurinus), only found in our region, staying close to Puget Sound and coastal marine waters. Noted wildlife author Russell Link writes, “They seem to prefer lower elevations and moist places, including creeks, streams and lakeshores.” Our crows can be mistaken for ravens because of their size, but most ravens in Washington live east of the Cascades. These fascinating birds are classified by ornithologists as one of the most adaptable and intelligent birds. A crow’s brain is quite large for its body size. They have their own language and can adapt and learn. They also have a well-organized communication system and can use and make their own tools. Crows work in teams and family groupings (adults and youth from previous years, aunts, uncles and cousins), helping care for nestlings and also posting sentries to alert groups of crows of dangers. On the Kitsap Peninsula, you may notice large nests built of sticks and twigs in stands of bare deciduous alders during fall. These nests, 1 1/2 to 2 feet in diameter, were most probably built by crows. Some of the nests are for laying clutches of eggs and raising young; others are actually decoy nests. Crows are very social among their bird clan, but they can be quite secretive around humans and predators such as raccoons, hawks and horned owls. In the fall when deciduous trees go dormant, drive up to Central Market and you’ll see the nests all along Highway 305 to the northeast from Central Market to Bond Road. The rest of the year these nests are hidden by leafy green foliage. Crows mate when they’re several years old and usually stay in these pairings the rest of their lives. Females lay four to six eggs over several days. Nesting takes place from as early as mid-March to as late as mid-July. The nests are 15 to 60 feet above ground in tall coniferous or deciduous trees. The nests are built from branches and twigs with linings of bark, plant fibers, mosses, hair, twine, cloth and soft materials. Crow youth from the previous year (sometimes several previous years) and other relatives help feed and care for the baby crows when they hatch in about 18 days. These same crow relatives often feed the mother as she incubates the eggs. Most crows live six to 10 years if they survive their first year. In the first year of life, about 50 percent of them die. However, one crow from a study at UW Bothell is thought to be 40 years old. The chicks remain in the nest for about four weeks but are still fed by the adults for another 30 days or so. Empty nests are abandoned until the next nesting season. Hawks, squirrels and raccoons make use of these nests for resting, shelter and sunning during the other seasons. After nestlings are fledged, the crows remain in groups of two to eight birds for the rest of spring and summer. From late summer through winter, they gather in large, communal groups for roosting at night. You might have seen flocks of crows sweeping and swooping through the sky in late afternoon and very early evening. They roost together at night for warmth and protection. Their territory of foraging, nesting and resting encompasses about 40 miles each day. People think of crows as being quite noisy at times, but during nesting they are quiet and secretive. The rest of the time, you’ll hear them communicating and even scolding. Some of the calls and crow communications have been described as caws, croaks, bracks and even melodies. Researchers have found that crows can recognize individual enemies and will dive at them in anger or to scare them away. Sometimes crows can become a nuisance. They are nature’s garbage crew. Crows eat carrion, human garbage and trash and any leftover food items they can find. They also eat earthworms, seeds and native fruits. They store food away for later consumption as well. They often bury their food or tuck it into crevices in trees. Crows in our region also drop clams and mussels down onto pavement to break open the shells. One study showed that the crows can actually time the retrieval to when the traffic lights change color so they can avoid being hit by oncoming vehicles. Link explains, “Crows help control pest insects and ‘clean up’ dead animals and garbage that has been scattered by other animals.” Humans fall into that “other animals” category. They can discourage crow pests by keeping yards and gardens clean, keeping garbage cans secured and not feeding pets outdoors. Link recommends putting garbage cans out early in the morning before pickup time because raccoons are notorious for opening can lids and strewing garbage around. Buying cans with clamps or other mechanisms that hold lids on is a good recommendation. Protect fruit crops with flexible bird netting using 4-inch mesh or even smaller netting if smaller birds are also a problem in your garden. Corn, a favorite of crows and other birds, can be protected with netting until plants are about 8 inches tall. Being out in the garden is rarely a chore for many gardeners who find great delight in all aspects of gardening. 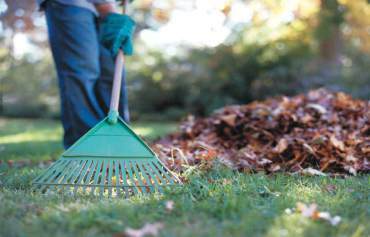 However, it is indeed a great time to tidy up gardens. Rake up and compost fall leaves, deadhead perennials (but leave some seed heads on for the birds), relocate plants (if desired), plant new arrivals purchased from the local nurseries and prune out dead and diseased twigs and branches from woody plants. If you can find some fall veggie plants, you could also get them into garden beds to provide nibbling and feasting opportunities through fall and winter. Kale, chard and spinach come to mind. This is a great time to read about how to grow vegetables. Some could even be grown in hoop houses if planted early enough. Or if you have a vegetable garden and want to extend the growing season, hoop houses can aid in that endeavor. The “Home Vegetable Gardening” publication, researched and created by Dr. Carol Miles, features 29 pages of excellent information on where, how, what and why to grow your own nutritious vegetables. (Download a free PDF) Also featured are photos, illustrations, maps, charts, tables, nutrition lists and even information on which veggies are the most economical and tasty to grow with comparisons to those purchased. Another great WSU publication is the Master Gardener Manual. 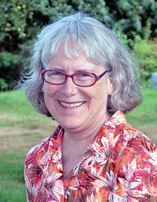 I highly recommend taking the complete course and becoming a Master Gardener volunteer educator for WSU Kitsap Extension. However, many people work full time or cannot volunteer any more time than they already do. They can still order the WSU Master Gardener Manual online in three different format options. Two are $25 (CD or flashdrive) and one is $125 for the 600-plus printed pages. Here’s the link. If you’re having trouble accessing the information or details, please contact the WSU Kitsap Extension Office at 360-337-7157. It’s a great resource for all gardeners whether a beginner or an expert. Remember that fall, before the holiday rushing around, is one of the best times to take a class either offered through local parks and recreation offices, local nurseries, WSU Extension Kitsap County or through the Master Gardener Foundation of Kitsap County. Bremerton Parks and Recreation and Poulsbo Parks and Recreation offices are open daily, Monday through Friday and can be accessed online. The WSU Extension office is open most Mondays through Fridays, and you can see course listings on their website. Many local nurseries have websites and newsletters sent via email. 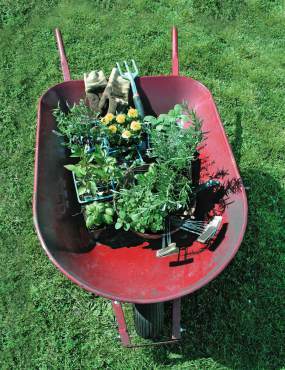 I’m looking for gardening topics to cover for the new “Gardening with Peg” segments. Please send me ideas to gardenmentor [at] yahoo [dot] com.